Well located for all the main sights, possible to get around on foot. Easy reach of termini station too. Staff were welcoming and efficient. Lovely stay. 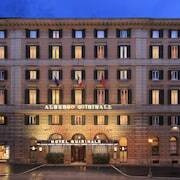 Great hotel for your trip to Rome Very good location, near Republica station. 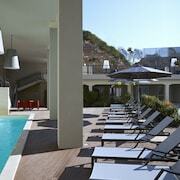 Friendly, helpful staff, lovely breakfast, free mini bar in the room was a refreshing change. Most areas withing walking distance, or a short metro ride away. Would recommend this hotel. Hyvä sijainti, aamiainen, henkilökunta. Huone pieni ja hieman kulahtanut. Convenient to stay, but not a home away from home I would never stay here again unless on a one night layover. The receptionist was rude, and rushed me to sign documents even as I told her kindly that I was still reading it. Upon entering my bathroom, there was left over excrement on the seat. Don't stay here, unless stranded at the airport. Nice hotel close to station bit further out for other areas of interest, booked hop on hop off bus to see more of Rome. Hotel was nice room was a bit grubby and didn’t get cleaned on one of the days which was disappointing. Overall staff very nice and helpful. It is a beautiful hotel. little bit expensive on their parking. 20 euro a day. We were out with the car most of the time, so even 10 euro for keeping it over night in the car park would have been ok. No kettle in the room. Any hotel I've been in had a kettle. 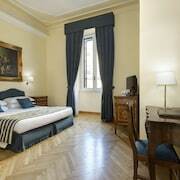 There are so many places to stay in Vatican City that it can be tricky to whittle things down. 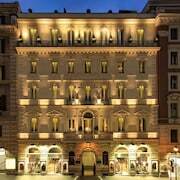 This is where ebookers comes in: we can show you the best hotels in Vatican City in a matter of moments. 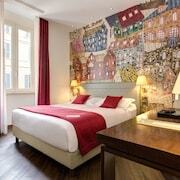 You’ll be able to see all the hotels on a detailed map, so you can check how close they are to various landmarks. In fact, you can specifically search for hotels that are close to specific attractions, as well as filtering your search for lavish, high-end hotels or comfortable, cost-effective accommodation. Our informative hotel descriptions, which include photos of the various pads and details on rooms and amenities, will help you make the right decision for your getaway. Whether you’re coming from near or far, you can make use of ebookers to organise your journey to your hotel in Vatican City. Searching for flights to Vatican City will instantly show which airlines and routes are available for your chosen travel schedule. You can then look up our car hire deals and arrange to have a vehicle waiting for you when you arrive, so you can go seamlessly from the airport to your hotel. Having your own wheels will also make it easy to travel around and visit more remote towns and villages, as well as rustic restaurants that might be out in the rural areas. You have a whole, exciting country to explore, after all. Let’s face it, one of the joys of being on holiday is doing as little as possible. Even just lounging around your hotel is an activity in itself. Of course, there’s so much to see in Vatican City, and if you’d like some inspiration then check out our Things to Do tool. This will lay out the attractions and major sights around your Vatican City hotel, so whether you’re just looking to wander and sightsee, or explore cultural attractions and places to take the whole family, ebookers will have you covered.